I've decided to broaden my Commander deckbuilding horizons a bit today. My favorite part of building Commander decks is finding sweet synergies and fun cards that interact directly with the legend I've picked as my commander. But then I run across people who have built theme decks outside of tribal synergies, and the small and neglected Vorthos side of me squeals in glee. 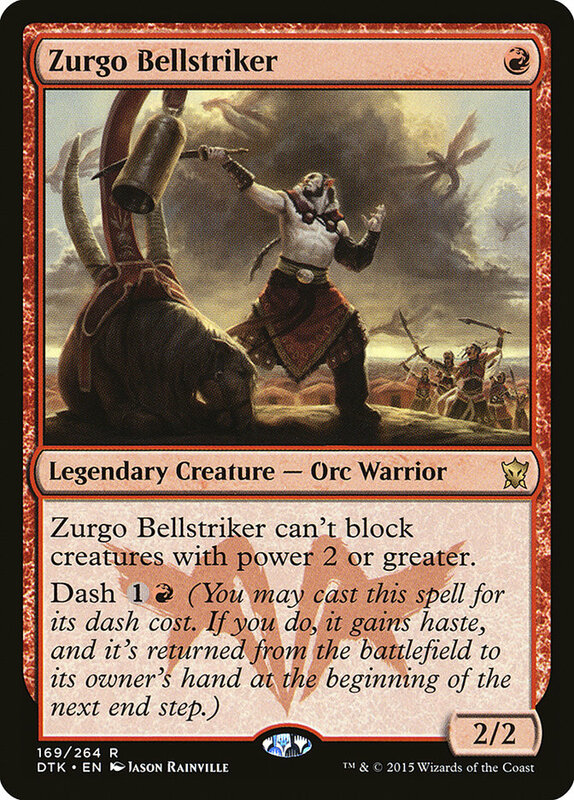 So while I pondered the next Commander deck I wanted to build and was looking over the recent legends that have gotten printed, I took a second look at Zurgo Bellstriker. I was a big fan of Zurgo Helmsmasher for Commander and actually presented two vastly different decks when I did my Commander write-up for him . He's a big bad dude… at least he was before Sarkhan went back in time and meddled with history! He went from being the nasty and potent Khan of the Mardu clan to being a just a bell-ringer for the Kolaghan clan. That's not to say the Kolaghan clan don't appreciate some dulcet tones to stir them for battle, but the new Zurgo is a far cry different from the old Zurgo! So in honor of this totally different Zurgo from this totally different timeline, I decided to do something totally different and make flavor a heavy consideration when assembling this deck. Okay, so my commander is Zurgo Bellstriker. Besides being a mono-red deck, what else do I put in it? Well, listening to my inner Vorthos, I decided to plug in "Bell" into the card database, checking off red and colorless and seeing what comes up. All but one of the cards that come up aren't exactly cards I'd ever consider putting into a Commander deck, but hey, beggars can't be choosers. The Kolaghan clan demands some bells be struck, and who is Zurgo to disappoint them? They want bells, they're gonna have bells! This little artifact costs just one mana and provides a tiny effect, one that's even tinier in a format where people are playing 100-card decks. Still, look at that picture and read that flavor text-that certainly seems like the sort of bell a red/black clan would want to sound! Even if it's unlikely you'll be decking anyone, being able to mill a card from everyone's library on demand can be mildly useful, especially if people are using things like Worldly Tutor or Volrath's Stronghold to put something specific on top of their deck. We can go a little further though, play something like Lantern of Insight so we can see what cards everyone's going to be drawing next, and if someone's drawing something the rest of the table doesn't want to see, ring Ghoulcaller's Bell to have everyone mill a card into the graveyard. To make the peek a little more directed - and to see a little deeper - we can play with Orcish Spy, who also has the flavorific bonus of being an orc like Zurgo! We can also use the Bell to clear off the top of our library if it's getting clogged with unneeded cards while we spin Sensei's Divining Top or activate Orcish Librarian (look ma, another orc!). Reading the flavor text of Temple Bell, I don't think it necessarily fits in with what the Kolaghan horde is all about-"enlightenment" and "silence" aren't words that immediately come to mind when thinking about orcs and goblins and dragons. 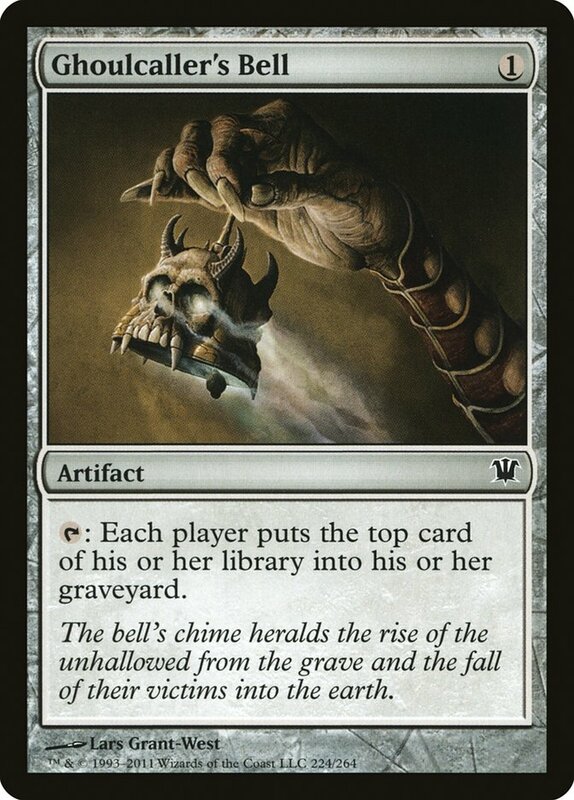 Still, it's a bell, and it's actually a very playable bell in Commander, and it can also play well in the other direction with the cards we talked about under Ghoulcaller's Bell-Lantern of Insight can let us know when it's okay for everyone to draw a card, and when it's not. 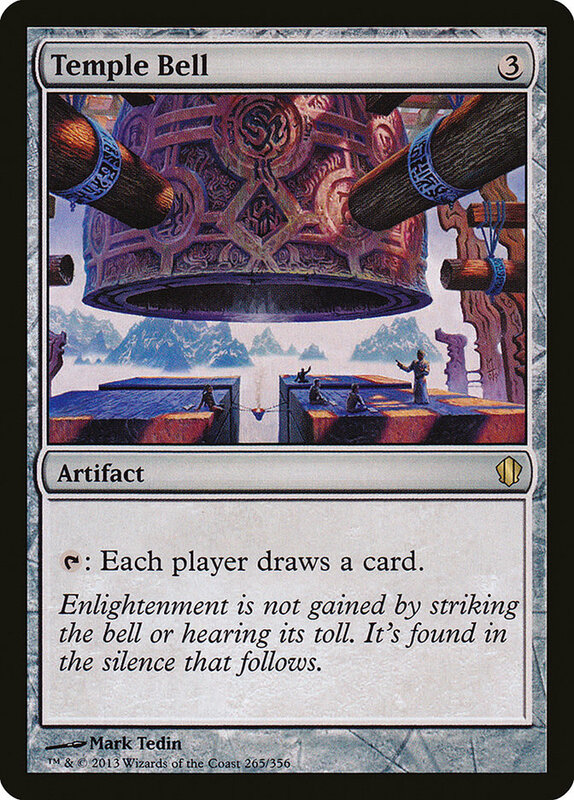 On the Vorthos side, I think I'll consider this bell as one that was plundered from an Ojutai temple, and Zurgo rings it to remind everyone of that sweet bloody conquest. 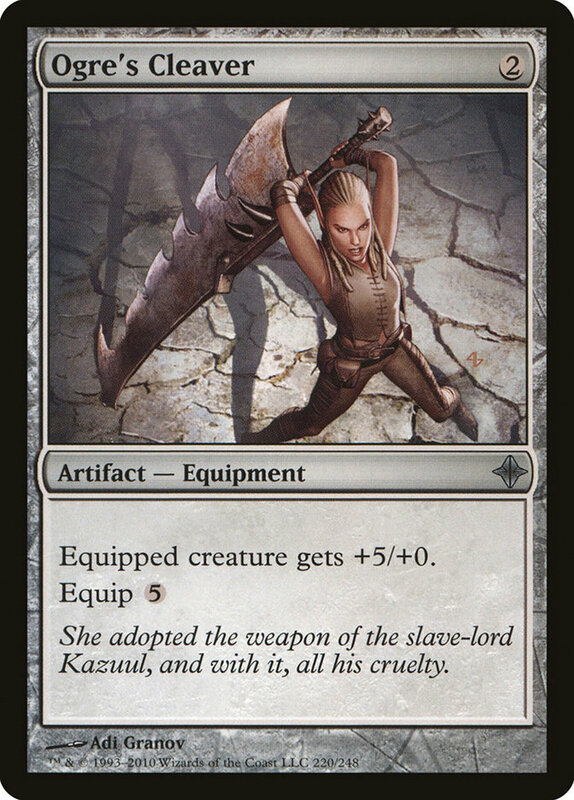 The artwork of Junkyo Bell brings to mind Jeskai (or rather, Ojutai) instead of Kolaghan, but if you look at what the card does and stretch things a bit… maybe the picture is depicting prisoner monks that are helping one particular creature be powerful enough to die a glorious death in battle? That could fit a Zurgo Bellstriker storyline. It's a shame this triggers during your upkeep because it would be nice to use red's plethora of temporary steal effects (mostly sorceries) to take a creature, pump it up with Junkyo Bell, and then sacrifice it rather than give it back to your opponent. At any rate, I can see this bell sometimes giving a nice boost to one of our creatures to swing in at an opponent, maybe even Zurgo himself-and he's so cheap you can easily recast him from the command zone. Then there's Kormus Bell. 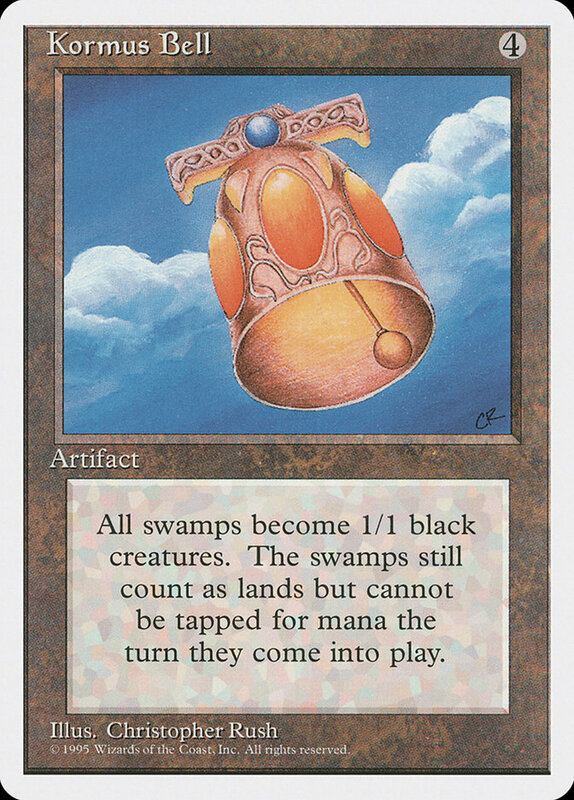 No flavor text, and nothing in the picture beyond a funky bell hanging from the sky. How does this bell animate swamps into creatures? Not entirely sure, and animating swamps into creatures sounds more Sultai/Silumgar than Kolaghan, but hey, we've gone this far with the Bells we can't stop now. So what in the world do we do with Kormus Bell? Other than cackling evilly when the mono-black player with infinite board wipes chokes on his Mountain Dew when you play it, can we do anything with this? Interestingly, there are two red cards that actually turn lands into swamps! Say hello to Slimy Kavu and Orcish Farmer… and look, another orc! It's like we've got a Zurgo family reunion going on in this deck. We can also use Mystic Compass to do something similar. I don't actually own a Cyclopean Tomb, but if I did, it would definitely belong in this deck. It's a bit expensive, but I might see if I can find one. What's nice about this combo with Kormus Bell is that we can punish players that are playing creature sweepers by turning one of their crucial lands into a Swamp so it dies to their sweeper. Sure, we can't push this into a devastating move like Kamahl, Fist of Krosa, but again, beggars can't be choosers. One thing we can do though is play Pyrohemia, so we can pick off one land per turn-a nice way to counteract someone who's going crazy with mana ramp, with apologies to the black deck. And hey-if someone's playing Urborg, Tomb of Yawgmoth? Well, at least little Zurgo is easy to cast for not much mana! Okay, so we've got a bunch of bells for Zurgo to strike. There are still a bunch of other deck slots to fill! We know Zurgo has the potential in him to be a badass… what if we give him the tools in this deck to realize the potential he reached in the original timeline? That could be fun, right? Build your own Zurgo Helmsmasher! The original Zurgo had a face-smashing seven power but with just a two toughness, and there's just one piece of equipment that can turn Zurgo Bellstriker from a 2/2 to a 7/2-Ogre's Cleaver! The mana cost and equip cost is clunky, but you know it's going to feel good when Zurgo makes that transformation. I also tossed in Hero's Blade; 5/4 is no 7/2, but in my mind, I envision Zurgo picking up this blade and feeling an echo from the other time and the other orc he could have been. 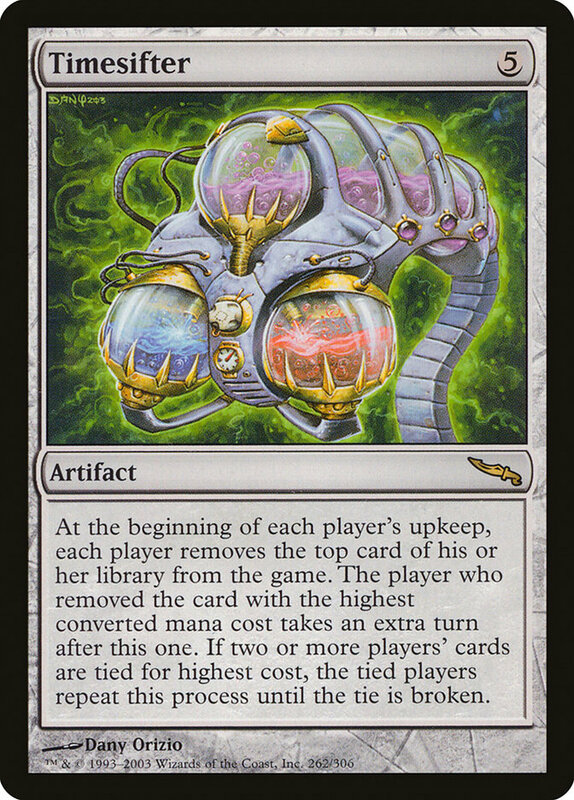 Between artifacts, red cards (and even a land or two), this is a pretty easy thing to add to the deck. I ended up nabbing Jawbone Skulkin because it felt like something an orc shaman of the Kolaghan clan would put together. Break Through the Line is a nifty enchantment for little Zurgo to get his beats on, and you can activate it before loading him up with equipment to make him unblockable. Then there's Crimson Mage, Lightning Mauler, Ring of Valkas, Anger, Flamekin Village, and Hall of the Bandit Lord, not to mention Zurgo's own dash ability. 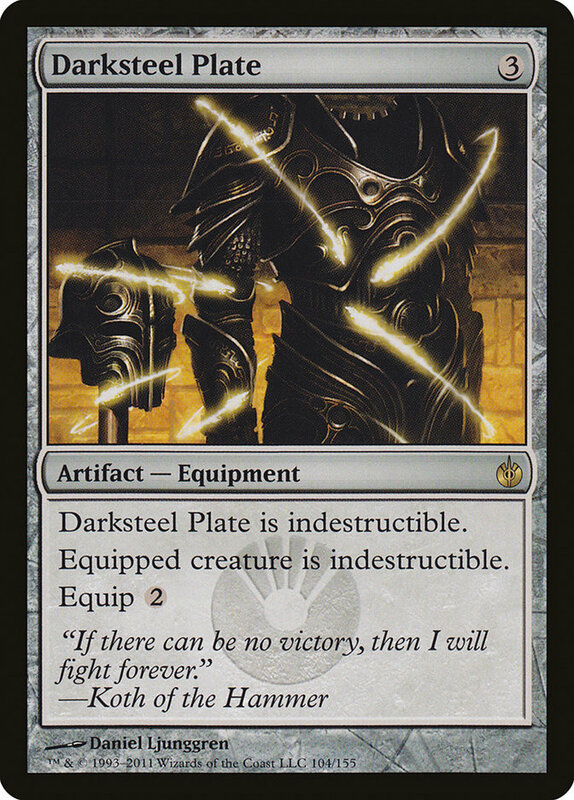 This isn't quite as easy to pull off in red, and so the only way I've got for him to become indestructible is Darksteel Plate in my deck. I thought about Eldrazi Monument, but I don't really have a bunch of token generators to reliably feed it. I didn't really find something to mimic this ability completely, but Blade of the Bloodchief is close, and we can use Ring of Valkas to add counters too. This one's easy-if little Zurgo is feeling like a Helmsmasher, then just turn him sideways! Speaking of smashing helms, I thought I'd sprinkle some Helms in the deck to call out to Zurgo's potential-- Prowler's Helm, Champion's Helm (between Hero's Blade and Champion's Helm our little fellow will surely be feeling his Helmsmashing self! ), and Helm of Possession. Batterskull fits in here simply because that's what happens when helms get smashed! I also decided to toss in a Timesifter because it fits-little Zurgo is what happens when someone sifts through time from big Zurgo's perspective and muddies up the place. It also happens to have decent synergies with some of the cards I talked about under Ghoulcaller's Bell. Alright, so after layering in all the sweet Vorthos flavor of Zurgo Bellstriker into the deck, I found that I still had quite a few other card slots available. Outside of the usual workhorse Commander cards like Sol Ring and Wheel of Fortune, I wanted to keep the Vorthos spirit alive by putting in some of red's fun and crazy cards. There's the new Humble Defector, drawing cards and getting passed around the table. Impact Resonance and Arcbond are two I'm looking forward to surprising people with. Wild Ricochet, Radiate, and Reversal of Fortune are classics that I haven't gamed with in a while. Mogg Infestation is a hilarious way to bring several board-threatening creatures down to a more reasonable size. 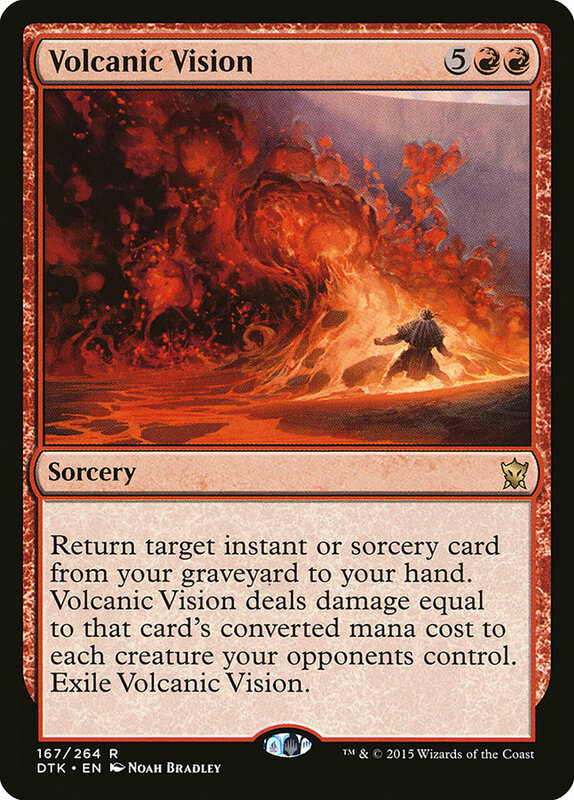 And I can't wait to see the sort of work that newish cards Mob Rule, Descent of the Dragons, Volcanic Vision, and Commune with Lava can do! With all the artifacts, I'm definitely looking forward to shenanigans with Trading Post and Goblin Welder, and maybe I'll get a free win by unexpectedly stealing a bunch of artifacts with a suddenly hasty Hellkite Tyrant. Since this is a mono-red deck and we have a little guy as our commander, I went ahead and added some firebreathing capability with Ghitu War Cry and Homura, Human Ascendant. So there you have it-an exquisitely crafted blend of flavor and function, an unparalleled instrument of epic storytelling! Or at least that was my goal… considering this is my first stab at "flavor first" deckbuilding, I'm sure there are many improvements to be made. What do you think? Are there any other Vorthosian elements I missed that scream to be included? How would you go about building a flavorful Zurgo Bellstriker deck?